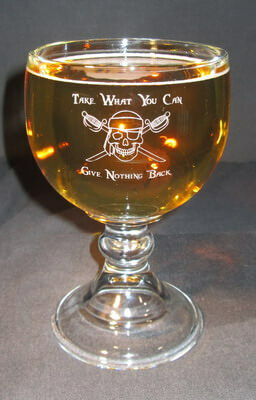 With a large bowl (to say the least) the Personalized Schooner enhances the flavor and aroma of your favorite beer. It has a wide foot for stability and the thick rounded stem fits nicely in the hand. This engraved beer glass also works well as a trophy for any event. It is 7.5 inches high and holds 21 ounces and has a Nordic or piratical sort of look to it. Personalization, text and/or design, on the front of the custom beer schooner is free, other options are available for an additional fee. We suggest keeping your text to 3 lines of 20 characters per line, it is okay to go over, it may just be smaller to fit it on the glass.